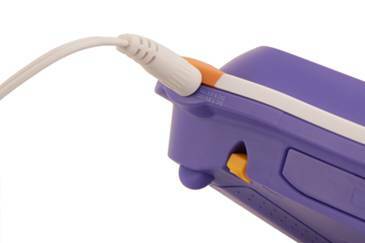 We recommend that you use a VTech AC adaptor (sold separately). The AC adaptor is not a toy, and it is not intended for use by children under the age of 3. Make sure the unit is turned off. Plug the power jack into the socket at the top right corner of the MobiGo®. Plug the adaptor into a wall socket. The unit is ready to turn on and play. Enjoy fun and learning with MobiGo®! NOTE: The use of an adaptor will override the batteries. When the toy is not going to be used for an extended period of time, remove any batteries and unplug the adaptor.